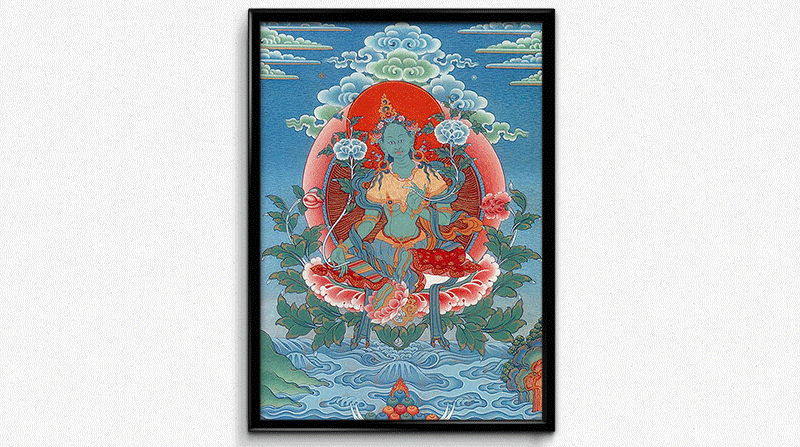 Green Tara, the Swift Liberator, is the principal female manifestation of enlightenment in the Buddhist tradition. According to her legend, many eons ago as the Princess Jnanachandra (Wisdom Moon) she devoted herself to the teachings of Buddha Dundubhisvara and made many offerings to that Buddha and his entourage. Eventually, as the result of her untiring practice, she generated the pure, altruistic bodhicitta motivation for the first time and thereby became a bodhisattva. By mastering extremely profound states of meditation she developed great skills in liberating others, and hence her name was changed to : TARA,the Savioress. In paintings and poetry she is often depicted as coming to the immediate aid of those in danger. Tara is often referred to as the One Who Rescues from the Eight Great Fears and is revered as the "Mother of the Buddhas of All Three Times."